As a leading ISP in Utah, XMission sets out to not only provide incredible customer service and relationships, but to educate our customers on the landscape ahead of them. 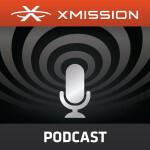 The XMission Podcast is another way that we aim to educate consumers about the technical world they live in. Focusing on the diverse landscape of Internet technology this podcast will cover topics related to fields we specialize in. The first episode, available here, focuses on fiber-optic Internet connectivity. Setting up a new office, or making a transition in Internet solutions, can be harrowing. As your office grows, you need something with room for growth, reliability, and of course, longevity. As a sales consultant for XMission Business, we come across a lot of questions and concerns about the future of Internet connectivity, various fiber providers, and how to maintain your office Internet as a whole. We decided to release episodes to help answer basic questions and provide an education for the community we service. Fiber is the future of Internet connectivity. This thin, strong connection to what makes your business successful is the fastest and most efficient way to get work done. Join Warren Woodward, Thomas Winkley and Lance Monson as they discuss what fiber can do for your office, what options are available in Utah, and what to look for while shopping for your office Internet. If there is a topic you’d like to hear about please send recommendations to podcast@xmission.com. You are also welcome to ask any questions via the same email. The Rules of Local Number Portability XMission upgrades to Zimbra 8.6 Email & Collaboration, then boosts quota to 50 GB!